We are proud to announce that in December 2014 we obtained a certificate of compliance with the internationally valued British standard for occupational health and safety management systems OHSAS 18001:2007. The Occupational Health and Safety Management System compliant with the OHSAS 18001:2007 provides employees and employers with a wide range of regulations and practices to ensure safety in the workplace. Implementation of the system is done through the management and oversight of key areas: from hazard identification and risk assessment, through a system of training, communication, control activities, emergency procedures, to measurement, monitoring and improvement. Already in April 2013, aware of global trends in the field of occupational health and safety and ensuring the safety of employees, but also wanting to meet the needs of our customers and the drilling industry, we decided to start work to implement the system. We are convinced that the implementation of OHSAS 18001 - apart from the obvious benefits - will also improve the overall performance of the company. 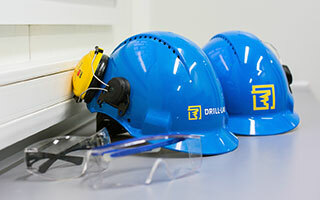 It should be added that the new standard is part of Drill-Lab' Integrated Management System, which combines - besides the standard OHSAS 18001 - commitments to quality in accordance with ISO 9001 and environmental protection in accordance with ISO 14001.